Eastern Bluebird at Goldy’s House! Breaking news from Goldy’s window! 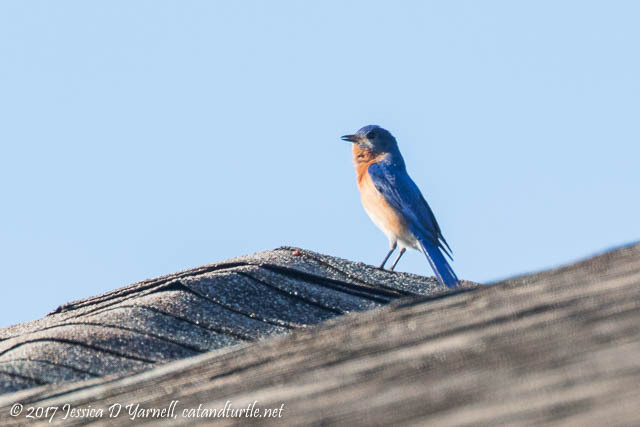 An Eastern Bluebird visited this morning! On Saturday I was driving back from Circle B when I saw these Eastern Bluebirds on CR 545 outside Winter Garden. I did a double-take, then quickly turned around and pulled over. I’ve never seen bluebirds around our house before! Ironically, I saw these near “Red Bird Road” (haha). I think it is a male/female pair. How cool!